Thank you, everyone, for your advice and knowledge! I just needed someone to tell me that leaving the machine on while walking away for 15 or 20 minutes was not going to send me to sewing purgatory for all of eternity! Also, a huge thank you to Angie, who emailed me and suggested the use of a surge protector. What a brilliant idea! Maybe this is commonplace for everyone, but I thought I would share it just the same! I have been getting to know my lovely new machine for a couple of weeks now. The machine comes with a bobbin wound and pre-loaded in the machine, so I left it there, and placed the first spool of thread I could find on the spool pin. I stared at the instruction manual for at least two minutes trying to figure out how to thread the darn thing. The manual gets a C+ for lousy diagrams. According to those lovely pictures, the thread looks as though it should be wrapped around the reverse button. Well, that did not look right at all. Instead of getting frustrated and continuing to stare at the confusing numbers and arrows in the book, I just decided to thread the machine how I thought it should work – and guess what, it did! I tried out a few of the decorative stitches, just for fun – and to be honest, it may be the last time I ever use them. Does anyone actually use all those stitches? Someday I will have to find a project that utilizes at least one of them . . .
Another thing that concerns me about the manual is the opening letter from Mr. Ueltschi – according to him, the Bernina 330 is meant for the “occasional sewer.” What!?! I am going to pretend that just means that Baby Bernina is not an industrial that gets an eight hour workout each and every day. And I have a question for those of you who use electric machines. Do you turn your machine off every time you step away, if only for one or two minutes? Here is my issue: I have a tendency to sew a couple of seams, go to the ironing board, then back to the table to pin more pieces together, and then back to the sewing machine. With Ms. White, I would turn the power off each and every time I stepped away from the table to save the overhead light. And it seems to have worked, because with all its use, I never had to replace it! So does anyone know if it is detrimental to the newer machines if they get turned on and off quite a lot? I would never dream of turning a computer on and off every time I step away – is it the same with a electronic machine, or am I over-thinking the whole thing? One more question . . . I am going to have to buy some new bobbins, and it looks like the Bernina specific bobbins cost a whole lot more – lovely! My little girl is high maintenance – gee, I wonder where she got that from! Well, the only ones I can find do not list any 300 models on the back!? I know the machine is relatively new, so will they still work? In other words, are Bernina bobbins universal to all models? I am currently working on a wool skirt with some bemberg rayon lining, and the tension really is fabulous from bulky wool to french seams on slippery rayon. And yes, I have a completed project using my new fabulous and lovely machine – I just have to cull through all of the photos to make sure I am not making any ridiculous faces! I wouldn't bother turning the light off. I once asked a Pfaff dealer that question and she pointed to her shop, where all the machines were turned on, lights glowing, all day so that people would be drawn to look closer. She never had any problems with burnt out bulbs. Those bulbs last a very very long time. Laura, I selected you to receive the Versatile Blogger Award. Come over to my site and pick it up if you wish and then pass it along to others. Thank you so very much, Julie! "Barely! From the opening salvo our worst fears were confirmed." "This is more upsetting than if she twirled atop the North Pole just to make the sun rise in the west." [scoffs] "Meanwhile, there it sits in all its glory, and seemingly atop an unmentioned treadle sewing machine cabinet." "She's probably treating the treadle like a dagger in her garter belt." "Not that Ms. White wasn't singled out and lauded again. Ode to the bulb-of-ages." "Mmm hmmm. Her machines are her army and her arsenal, and we're out-flanked." [quick exhale] "Then at the end of her spiel she fessed up and trumpeted the up-and-coming project." "Mmm hmmm. Listen sister, we're in for it now. Precision seams, the fit and finish of lining which lies like a second skin, and her poses!" "We were duped! Deceived! She was wading through wool the entire time." "We're nothin' but the lambs in her Rodgers & Hammerstein blaring sewing room/slaughterhouse." [in unison] "THAT Laura Mae!" When I'm sewing I never turn my machine off and on. I leave it on for hours at a time and I have a few older machines as well as a newer electronic one and a computerized one. I've never had the bulbs burn out. It might be more wear and tear on the machine to constantly turn it off and on. I took a class on craftsy.com called "Stupendous Stitching" and came up with a lovely wall hanging utilizing tons of my decorative stitches. It was a really fun project. I liked the class, but you could probably just look at the sample to get an idea of what to do. I never switch off for just ironing and stuff - I think with Bernina you lose your stitch settings if you don't save them, and I haven't yet figured out how to do that. :-) Love my Bernina (QE440, more decorative stitches than I would use), but accessories are certainly expensive and there are different bobbins available, so I'd advise to check with a dealer. Really enjoy reading your posts! I have a computerized machine and I neverrr turn it off when I'm sewing (and, er, sometimes I leave it on for even longer than that! Whoops haha!). Haven't had a need to replace the bulb yet, and my machine & I have been together for 4+ years at this point. I think you might actually do more harm than good turning a computerized machine on & off that frequently. For the bobbins, contact your local Bernina dealer and they should be able to set you up with the right bobbin. My Pfaff uses special bobbins too, and a 10 pack is about $8 so I feel your pain! I just bought a pack every time I went to the store, now I have plenty of bobbins :) I'm not sure if this is the same with Bernina, but my Pfaff dealer told me that Pfaff does not authorize any of their stuff to be sold online (excluding individuals who are selling their used machines/accessories, of course), so you have to get it from a dealer. Anything you see on ebay/etc is likely aftermarket. Just something to think about! I used to leave my electric machine on all the time, when I stepped away to press, etc, then I'd get caught up in something else with the cat or kids or hubbie or delivery people, and hours/a day later my machine was still on. My lightbulb died quickly. Now I am in a habit of turning my electric sewing machine off every time I step away, even if only for a couple of minutes to press or what not. If I'm not actually at the machine I turn it off and it's no worse for the wear. Three years with the same light bulb and I figure any way to save a bit of money is a good thing. Also if I were you, I'd go to a local store that sells Bernina and casually ask for a demo of your model. They are always thrilled to do that. They should even let you do a test run, etc, etc, etc. I probably wouldn't tell them I already had one, lol. That will at least answer all the basic questions you have to speed you along a bit. I have fancy stitches which I always meant to put on my little girl's clothing but she is soon to turn 19. Oh well. I think they are cute for little girl clothes. I have a Pfaff so I'm not familiar with Bernina. But I've always gotten test drives at the store first. Even recently when I moved across country and the moving guys dropped my Pfaff. So I went to the local Pfaff dealer to get repair quotes to send to the insurance company. It was beyond the price of repair so they told the insurance company to give me money, $1000, to replace my year 2000 model. Meanwhile they gave me a test drive with comps which I thought were pretty snazzy upgrades at the time. Then I got my comp 100% paid for by the moving company and I don't like it as well as my old one.The new one is plastic and just doesn't seem to perform as nicely as my old metal one. Because the old Pfaff was dropped, something broke that makes the arm wobble. I'd rather stick a paperback under that arm and sew with that one than the new one, but I'm trying to be faithful to this new one and stick with it. I might give the new one to my daughter though to learn on. I don't turn my machine off in the midst of sewing - only if I'm taking a long break, over 30 minutes. My model loses the stitch settings if I turn it off, so my sloth has a positive result. I hadn't even thought about the light, but I assume it's replaceable if it ever burns out. All Berninas use the same metal bobbins with the groved spindle (the one that came in the machine I assume). You can buy them relatively cheaply at a Bernina dealer, mine threw in a pack of 20 for free when I bought the machine so I've never run short on them. I have (bad!) thrown in a plastic universal bobbin and it worked, probably not the best idea but for a quick seam it worked. Oh and I leave my Donna (a Bernina 430) on the entire time I am sewing for the day and then shut her off when I'm done. It hasn't harmed anything so far. I think the reboot when you turn them off and then back on is harder on them than just idling there while you sip coffee. 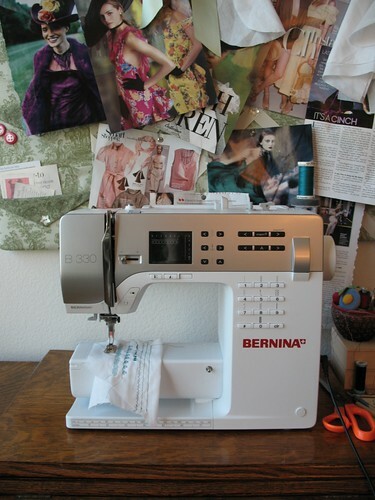 There are two main styles of Bernina, rotary hook or CB. The rotary hook systems have a 9mm maximum stitch width and the CB systems have a 5.5 maximum stitch width. Each style uses a different type of bobbin. Your machine is a CB style, make sure to purchase bobbins specifically for that style of machine. I have a Bernina and I leave it on while I'm sewing, pressing, trimming, etc. I've been using Bernina machines since 1974. I think in all that time I might have replaces bulbs half a dozen times. I used to run the Costume Department for a Junior college and we sewed 8+ hours a day, 11 months a year. Machines got turned on in the morning, off at night. Yes, use a surge protector but other than that don't worry. Keep in mind the greatest "damage" to a bulb occurs when you turn it ON, that's usually when the filaments break. As for the bobbins, you can buy a generic version that work pretty well but if you're concerned buy a dozen or so of the Bernina specific ones and you'll be set for years. I still use models 830 and 930, more so than the current electronic ones. Why? We had a flood at school one year that left 5' of water in the shop. The machines ended up on the floor in sandy water for 2 days. We pulled them out, dried then and sent them off for a spa day. They cleaned them, oiled them and I am STILL using one! My girlfrend has one of the fancy electronic models we do use for the embroidery stitches but it balks at super heavy (8 layers of denim) stitching. That's where the older models work better. These machines are work horses, they were designed and built well. Yours may be designed to stitch 4-6 hours a day but keep in mind you aren't going to be sewing solidly in those 4-6 hours the way we used to do. You should be fine : ) Good luck! !